^ a b Yadav, Hemant K.; Shukla, S.; Singh, S. P. (16 August 2006). 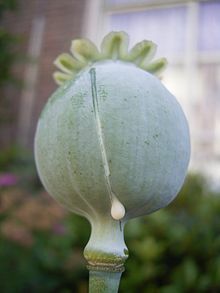 “Genetic Variability and Interrelationship Among Opium and its Alkaloids in Opium Poppy (Papaver Somniferum L.)”. Euphytica. 150 (1–2): 207–214. doi:10.1007/s10681-006-9111-x. ISSN 0014-2336. ^ “BSBI Distribution Maps, Papaver somniferum”. London, U.K.: Botanical Society of Britain and Ireland. 22 April 2016. ^ a b “How the DEA Scrubbed Thomas Jefferson’s Monticello Poppy Garden from Public Memory”. AlterNet. 2 March 2010. Archived from the original on 4 December 2018. Retrieved 7 January 2018. ^ a b c d e Ye, Kai; Graham, Ian A.; Bowser, Tim A.; Lu, Ying; Teodor, Roxana; He, Zhesi; Ning, Zemin; Li, Yi; Yang, Xiaofei (19 October 2018). “The opium poppy genome and morphinan production”. Science. 362 (6412): 343–347. doi:10.1126/science.aat4096. ISSN 0036-8075. PMID 30166436. ^ “Unapproved Drugs, What’s the Big Deal?” (PDF). International Journal of Pharmaceutical Compounding, Winter 2006. Retrieved 3 January 2009. ^ Dicker, Jason. “The Poppy Industry in Tasmania”. University of Tasmania. Retrieved 2 September 2009. ^ Braund, Claire (2001). “Research driving the Tasmanian poppy industry”. Australian Society of Agronomy. Archived from the original on 29 July 2009. Retrieved 2 September 2009. ^ “Poppy for Medicine”. Poppy for Medicine. Retrieved 2 September 2009. ^ a b c Pinke, Gyula; Tóth, Kálmán; Kovács, Attila J.; Milics, Gábor; Varga, Zoltán; Blazsek, Katinka; Gál, Katalin E.; Botta-Dukát, Zoltán (3 July 2014). 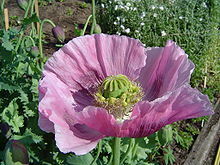 “Use of mesotrione and tembotrione herbicides for post-emergence weed control in alkaloid poppy (Papaver somniferum)”. International Journal of Pest Management. 60 (3): 187–195. doi:10.1080/09670874.2014.953622. ISSN 0967-0874. ^ a b c d PINKE, G; PÁL, R W; TÓTH, K; KARÁCSONY, P; CZÚCZ, B; BOTTA-DUKÁT, Z (16 September 2011). “Weed vegetation of poppy (Papaver somniferum) fields in Hungary: effects of management and environmental factors on species composition”. Weed Research. 51 (6): 621–630. doi:10.1111/j.1365-3180.2011.00885.x. ISSN 0043-1737. ^ Voglmayr, Hermann; Montes-Borrego, Miguel; Landa, Blanca B. (7 May 2014). “Disentangling Peronospora on Papaver: Phylogenetics, Taxonomy, Nomenclature and Host Range of Downy Mildew of Opium Poppy (Papaver somniferum) and Related Species”. PLoS ONE. 9 (5): e96838. doi:10.1371/journal.pone.0096838. ISSN 1932-6203. PMC 4013089. PMID 24806292. ^ Barnawal, D.; Pandey, S.S.; Bharti, N.; Pandey, A.; Ray, T.; Singh, S.; Chanotiya, C.S. ; Kalra, A. (3 April 2017). “ACC deaminase-containing plant growth-promoting rhizobacteria protect Papaver somniferum from downy mildew”. Journal of Applied Microbiology. 122 (5): 1286–1298. doi:10.1111/jam.13417. ISSN 1364-5072. ^ Tang, Joe; Lebas, Bénédicte; Liefting, Lia; Veerakone, Stella; Wei, Ting; Ward, Lisa (29 October 2015). “Opium poppy mosaic virus, a new umbravirus isolated from Papaver somniferum in New Zealand”. Archives of Virology. 161 (1): 197–201. doi:10.1007/s00705-015-2651-4. ISSN 0304-8608. PMID 26514844. 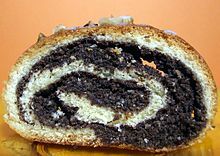 ^ Bečka, D.; Cihlář, P.; Vlažný, P.; Pazderů, K.; Vašák, J. (3 October 2014). 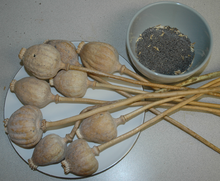 “Poppy root weevils (Stenocarus ruficornis, Stephens 1831) control in opium poppy (Papaver somniferum L.)”. Plant, Soil and Environment. 60 (10): 470–474. doi:10.17221/417/2014-pse. ISSN 1214-1178. ^ McGrath, Ginny (8 February 2008). “Travellers who ‘smuggle’ poppy seeds face Dubai jail”. The Times. UK. Retrieved 2 September 2009.